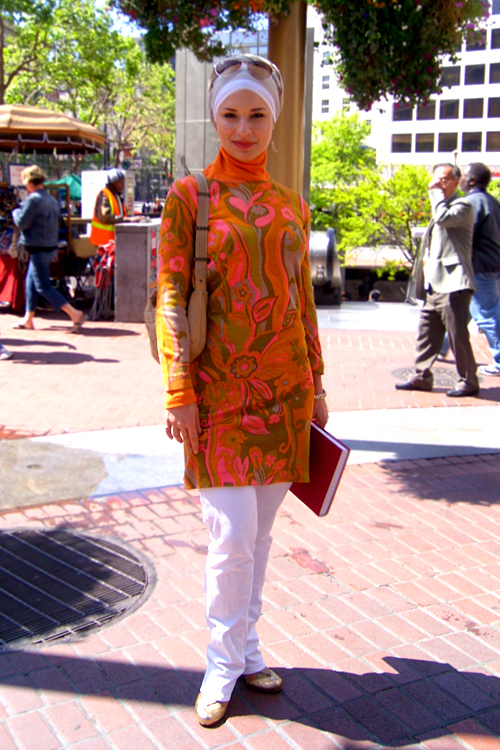 International street style from fabulous hijabistas - "Hold your hijabs high!" Discreet pretty ztyling with nice colors. Masha'Allah! Masha'Allah what a stunning sister,her style is so bright and colourful. Love turbans. So chic. Like Sheikha Mozah from Qatar. She is so beautiful with her hijab! Mashallah the sister looks vibrant in this colour, with lovely white to compliment her complexion. I am wondering though, doesnt she have another picture on this site too? If she is the same girl i saw before, she is one stylish chick! once again you have mesmorized us all... first for Nancy Paloci's reception and now!!!! you do have one of a kind taste!!!! beautiufl! I think you should have a picture of her each week/month as a running lookbook of chic hijabi stye. Want to see more of her pleeeeeease!! BTW I think she is Turkish. Fab! I love the Bay Area ladies representing! Great one here! Her printed shirt is so fabulous. Beautiful colour and chic hijab styling. Fantastic style, understated glamour and modest to boot... mashaAllah, sis, you look great! i wish i could wear kaftan/tunics 1/2 as well as she does!! I really love her style! Hijabs High is inspired by the stylish and dynamic global community of Muslim women who fuse their identities and pronounce their place in the world everyday through beauty and fashion. It is my hope that this blog inspires, motivates and encourages Muslims and non-Muslims alike to revisit their perceptions of the "look" of Muslim women who wear the veil and encourage us all to be a little bit more fabulous. Finally, Hijabs High owes a debt to The Sartorialist, who first helped focus our cameras on the everyday. Thank you. Want to get in touch or contribute a photograph from your own city? Feel free to contact me here. The contents of this site, including all images and text, are protected by copyright. All material is provided for browsing and viewing purposes only. No copies of the digital images or text may be made without the written permission of the copyright holder(s).